Though he has traveled far and wide Steve’s bicycle tours here in the USA have been adventures in their own right. From road bike touring the Pacific Coast to mountain bike touring through the high passes of Colorado and many miles in between, Steve has honed bicycle touring to an art that allows the utmost freedom and exemplifies a unique style of adventure. As participants learn gourmet camp cooking techniques, how to have fun with companions of different cycling abilities (especially your spouse or partner,) route planning strategies, how to train and the finer points of packing, Steve makes this how-to clinic almost as much fun as the trip itself. If you’re a member of a cycling club, your compadres will thank you for bringing this fun-filled how-to bicycle tour clinic to their attention. For bike storeowners this sure hit will get people in the door. 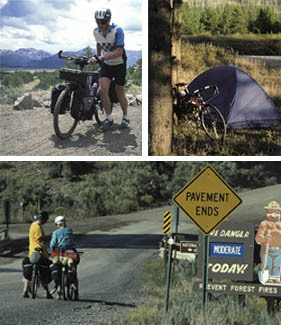 The Cycle touring America and European Touring programs can be combined in a two or three-hour clinic. Both are filled with images, stories and the answers to touring questions Steve gets asked everywhere he goes.